Go from chasing your tail through paperwork and spreadsheets to streamlined rental operations in days. Our online rental software has all the time-saving tools you need to grow your business easily! 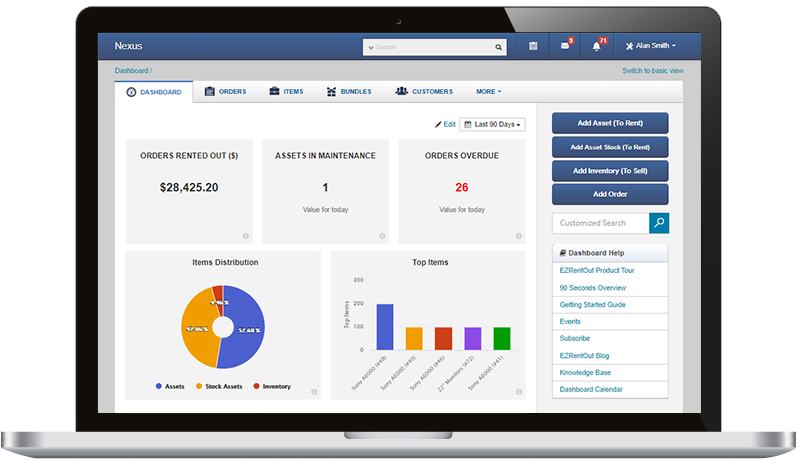 Quickly create, update and manage all your online and offline orders to streamline equipment rental operations across locations. Create customized professional-grade invoices and auto-generate these invoices to track payments on monthly orders with ease. Schedule orders well in advance, and quickly reserve rental equipment for customers. This leads to conflict-free bookings, every time. Track the location, maintenance status, and availability of your rentals with ease, and set handy alerts to prevent stockouts. Access your rental business from anywhere with our iOS and Android mobile app. Scan equipment Barcodes and QR Codes, too. Increase traffic and grow effortlessly by helping customers find your business, see your rental catalog, and reserve items online. Here's what they have to say about EZRentOut. I love how easy the layout is! The customer support is just amazing. I love how customers can suggest features, and the EZRentOut staff takes them into careful consideration based on overall functionality. All Data at my Fingertips! Fantastic experience! All data at my fingertips! I know when they were purchased, from whom, and for how much. I know which customer has which instrument, and can keep renters current with payment. Everything we need in one place; EZRentOut makes it easy to be professional and run a business! The navigation, design, and layout is simple & consistent! There's very little delay for teaching new users how to operate the software. Have questions, concerns, or feedback for us? Our customer support team is always here to help you make the most of EZRentOut. Our user-friendly interface and in-depth knowledge base make it easy for you to learn, regardless of your team’s technical abilities. Cloud-based rental management means safer data, and access to regular feature updates for free! See What's New in EZRentOut. Everything Your Rental Business Needs Is Right Here! Hassle-free rental management is just a few clicks away. Equipment rentals are a billion dollar industry. Every year, the opportunities for growth and revenue within this sector increase substantially. At EZRentOut, we want to make sure our rental business customers have the edge when it comes to these opportunities. Construction and Tool Rentals: Tag and track construction equipment, and set up maintenance and calibration schedules to ensure great performance. AV and Production Rentals: Set asset custodians for your AV rentals, and use custom fields to track all the nuanced specs of your AV gear. Party and Event Rentals: Group props and decor items by custom attributes like color, material, or size, and plan out deliveries well in advance. IT Rentals: Automate servicing reminders and easily check for the availability of fast-moving IT equipment for conflict-free reservations, every time. Sports Rentals: Check sports gear out to customers, keep track of orders, and take mass actions on items for quicker processing. We’ve really honed down on what makes a rental business successful - no matter the industry. This is why we’re committed to helping you manage your rental assets, customers, and invoices - all from a single space. See why thousands of companies love us. EZRentOut is an equipment rental software used and loved by companies all over the globe.